Breckenridge ski area is to the right above the map. It would take maybe 45 minutes to drive there. The wind was really fierce up top when we arrived, though it settled down later. 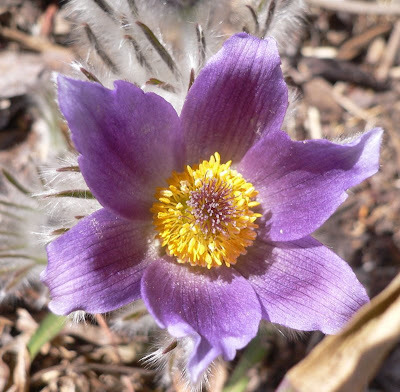 In the afternoon, I traded snow and long views for 60 degrees and a close-up with a pasque flower (Pulsatilla). Pasque means Easter, which is about when this blooms. Except this year, when Easter came very very early. 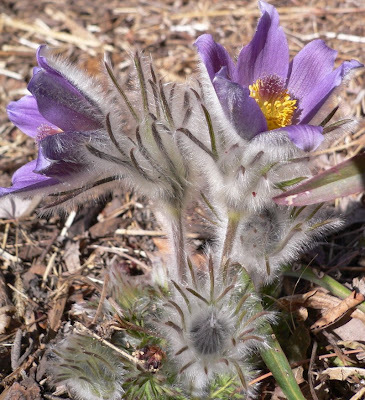 The purple is pretty, and what makes it interesting is its exceptional hairiness. Wow looks like a beautiful mountain to ski down! Wow I wish they had something like that in Central New york! Central New York sure would look different if you did!